ACUBALANCE FACIAL'S MOVED TO THURSDAYS! Christina Ceconni has opened her schedule to offer 90 minute facial acupuncture and low level light therapy (LLLT) treatments every Thursday. What better way to end your week or start your weekend than with a truly restorative treatment that is relaxing, safe, natural, and effective? 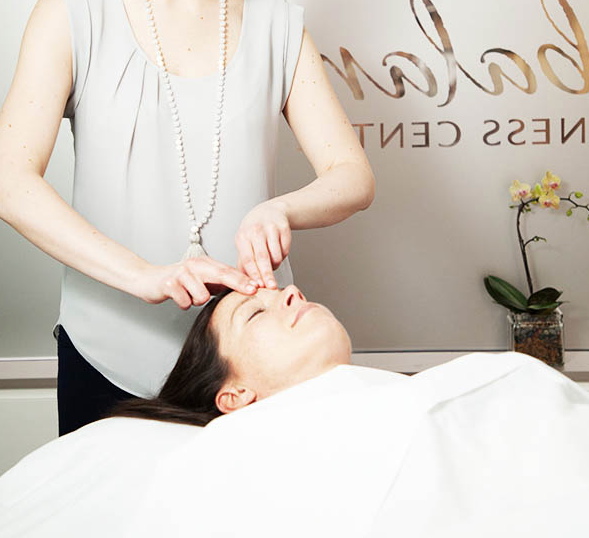 Christina Cecconi is a licensed acupuncturist and herbalist who has trained in both New York and Vancouver in a variety of facial acupuncture styles and techniques. Her treatments combine the ancient wisdom of Chinese Medicine with the modern benefits of low level light therapy (LLLT) - a safe, non-invasive use of polychromatic light to stimulate tissue cells, as well as help, kill acne causing bacteria. Your first visit begins with a full skin assessment and consultation to go over your goals. A Chinese medical diagnosis will be made to determine your current state of health and what kind of support to benefit your skin. Based on your individual diagnosis, a few select acupuncture points will be placed in your arms and legs to balance hormones, reduce inflammation and improve circulation to support your skin from the inside out. This will be comfortable and relaxing as Christina uses a gentle technique and high-grade tools from Japan. Cool jade rollers are then massaged over the face to prepare the skin for treatment. Special small, fine dermal needles are placed in the face according to your individual needs and beauty goals. These needles can be used to both relax and tone muscles, increase circulation bringing blood and resources to the face, reduce swelling and inflammation, and encourage collagen production as the skin responds to the treatment. Once the facial acupuncture is complete, a panel of LEDs ergonomically designed to hover just above the needles will be placed over the face. This low-level light therapy uses specific wavelengths that penetrate the skin to the target depth to stimulate energy production in the cells and/or kill acne-causing bacteria depending on the wavelength used. low-level light therapy (LLLT) cannot burn or denature the tissue making it a completely safe, non-invasive treatment. Find out more about LLLT for ageing/damaged skin, and for treating acne. You will then relax for 30 minutes on our relaxing & warm Biomat treatment table while the needles and lights work to repair and renew your skin. Once the treatment is complete, needles are removed and a facial massage using organic, non-fragrant plant oils is performed. This acupressure massage helps lymphatic drainage, further boosts circulation, melts muscle tension, and leaves both mind and body relaxed and refreshed! CALL 604 678 8600 OR EMAIL CLINIC@ACUBALANCE.CA TO BOOK FOR THIS OR A FORTHCOMING THURSDAY.